Turtles are a lovely aquarium addition with very interesting characteristics. They are aggressive swimmers that move from one end of the tank to the other effortlessly if the right turtle tank conditions are put in place for them. They are very unique animals in a number of ways too. For one, they do not have saliva and depend on water to soften the food they eat. Secondly, they are cold-blooded and need to warm their bodies regularly if they must be healthy. Thirdly, they obtain plenty of their exercise from swimming actively. With these facts in mind, it is crucial to maintain the right habitat that favors them. The following is a guide that should help a hobbyist do a proper setup for their turtle tank and maintain the right tank conditions. As a matter of fact, most hobbyists prefer an aquarium to other forms of habitat not only for the turtle but other fish types as well. The reason is simple; they offer the chance for one to watch the animal from many angles. Aquariums are also easy to set up after purchase. This has made them extremely popular. Different people can afford different tanks. So long as the purchased item can comfortably hold water, it should serve the turtle adequately. Plastic pond liners and large tubs are a great way to house the turtle. A pre-formed pond can be a great way to save on hard earned cash. If it is big enough, say 100 gallons or more, it can house many turtles at one go. The only downside to it is that it needs plenty of space that may not be easily available in most restrooms. Turtles need UV lights. This may sound like some kind of luxury which it is not. The light is a necessity as the turtle needs to bask in the sunshine. Since this is not possible when it is inside the tank, the UV light is the next possible option. After providing the light, the next requirement is an area set aside for this activity. Setting up a docking station should be ideal. Here, the turtle will crawl out of the water and have light warm its body. As mentioned earlier on, the turtle has to crawl out of water to get some light on its body regularly. A turtle needs a gulp of air too. Without this ritual, it may eventually die. The dock is best set up at the top of the tank. This way, plenty of space is saved. It is different if the space is set sideways as it will mean more space. As the turtle moves around the tank, water gets dirty. Turtles are known to be messy. Making observations from a dirty tank is not a pleasant idea. This means that the water will need to be changed regularly. It can be very tiresome. The best alternative is having a filter that will keep the tank clean. Bigger filters are very ideal, though they can cost the earth. Currently, good filters should have bio-wheels that can help grow lots of beneficial bacteria. Turtles, like most other animals, thrive when their nutritional needs are met. As a matter of fact, good nutrition keeps the turtles growing faster and helps prevent them from easily contracting diseases. Tanks look lovely when some decorations are added. Although this may sound like a luxury that is not actually necessary, a good looking tank gives a room that aesthetic touch. Turtles are known to be quite aggressive and are likely to uproot most plants inside the tank, making a meal of them. The substrate is not spared either. If small sized, there is a likelihood of the turtle swallowing them up. To avoid this kind of scenario, use large substrates that cannot be gobbled up as this may endanger the life of the turtle. Turtle tanks come in various sizes depending on what one desires. For a small turtle (baby turtle), the ideal tank is small but with facilities that make it complete. The fact that an aquarium is tiny should not be reason enough to ignore certain requirements. A young turtle has various needs to grow to maturity. Requirements for the small turtle tank include enclosure, filter, basking space and turtle food. Measure the turtle (literally) using a tape measure. This is done in both dimensions (length and width). If the measurement is in cm, multiply the results of the measurement by 15. In case it is in inches, the result should be multiplied by 10. The result of that arithmetic should be the same as the capacity of the tank (in liters and gallons respectively). In case more than one turtle will be housed in the same tank, the dimensions will have to be different. In that case, the results of the arithmetic (number one above) should be multiplied by the number of the turtles. Otherwise, a small turtle tank would be best suited for just one turtle. Arrange substrate that will not be eaten by the pet turtle. To be sure of their safety, use larger pebbles rather than small ones. Add some plant life too. It may be devoured after just a while but be prepared to add more as plants are a source of vitamins to the turtle. For decorations, use plastic plants that are well anchored onto the tank. This may be tampered with too, though young turtles do not have the same stamina as mature ones. The decorations may therefore survive for some time. Turtles crawl out of water once in a while for a breath of fresh air and to bask in some source of heat. However, they never do their dirty things during these breaks away from water. Instead, they are wont to throw their droppings inside that water that also houses their feeds. To keep the tank safe for their needs, there is need for a water filter. Young turtles in small tanks are okay with waterfall filters. As they grow however, they are likely to outgrow these. Waterfall filters are affordable though have got their downsides. They require to be cleaned regularly since algae grow on them. At the same time, replacing their cartridges occasionally is a necessity. This is different with the canister filter. A hobbyist cannot just purchase any kind or size of filter. Certain considerations are necessary. Before buying a filter, ensure that the size of tank is commensurate with the filter. If the tank is small, a smaller filter will be suitable. In addition, you need to ensure that the filter has good rating. Look out for reviews on the best filter for the tank. The baby turtle, like the mature one, needs to bask in some kind of heat. Without this ritual, the turtle will develop certain infections that may lead to ill health or even death. To avoid this, a basking area is a necessity. A small tank can be arranged in such a way that the basking area is floating on the upper part of the tank. As the turtle grows in size, it may need something else as its weight may make it sink. A turtle eats a variety of foods. These are put inside the water. Vary the feeds for complete nutrition. Offer feeds that will be cleared as leftovers tend to pollute the water. Of course the water filter has a role in the tank. However, keeping the tank clean should be a priority at all times. 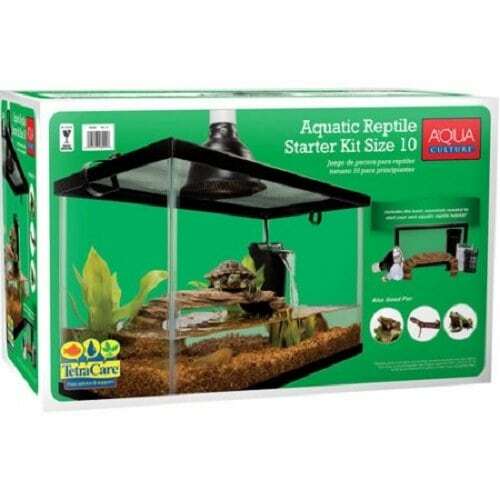 The Zilla Reptile Starter Kit is a great starter kit for those looking to create a 10 gallon turtle tank. The kit has a number of features which include it can house different kinds of animals including desert animals. The kit comes with a terrarium glass (size 10) that has a screen cover emitting fresh air. In addition to that, it has a terrarium liner that is brown with a temperature or humidity gauge. The tank also comes with 2 reflective 5.5 inch dome light fixtures – white spot bulbs and night black incadescent bulbs. They are shipped in a reinforced packaging that helps protect them and you can choose to have a packaging that reveals contents or conceals them. 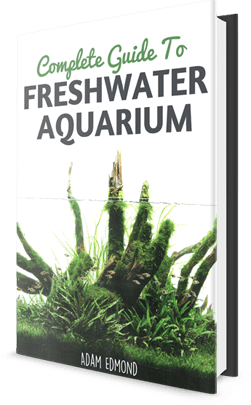 The Aqua Culture 10 Gallon Reptile kit comes with a see through glass house that gives the hobbyist an opportunity to monitor the movements or activities of your turtle throughout the day and night. There’s also a locking screen lid that helps alleviate the worry of your turtle escaping or an invading animal getting to them. Plus, a basking platform is provided that allows for your turtle to soak in the UV light and stairs that make for easy climbing as it moves to the basking platform. 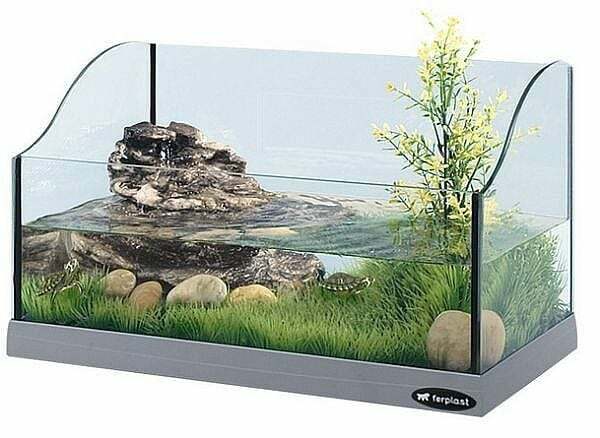 The kit also include caves for hiding when the pet is in need of solitude and a dome lamp with a 60W bulb for keeping the turtle warm, making it a great 10 gallon turtle tank. 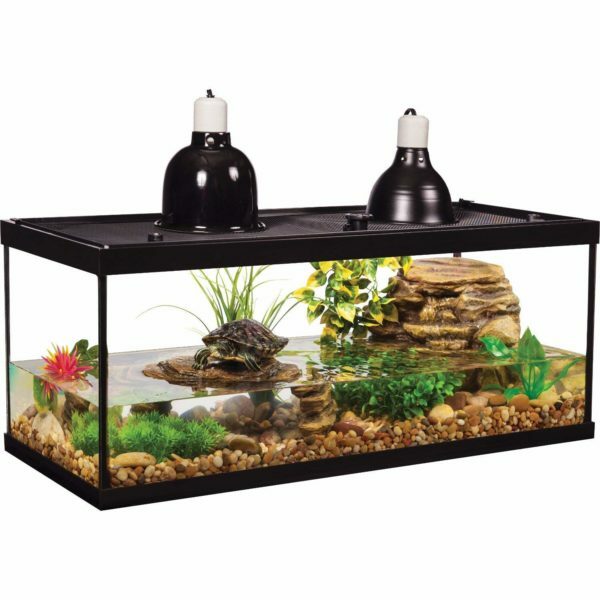 The tetra deluxe aquatic turtle kit comes complete with a number of features which include a decorative filter plus cartridges, a sizeable basking platform, a screen top, heating lamps, boxwood plant mat and two dome lamps at the top of the screen. With the decorations, this 20 gallon turtle tank looks absolutely beautiful with the waterfall radiating elegance. The tank can accommodate a variety of tank pets including turtles, frogs and newts. This attractive design Marina Style 20 Deluxe can be a great addition to the home decor. It comes fully furnished with almost everything an aquarist requires. This makes it quite easy to set up. As a matter of fact, it can be a great idea for a first timer. 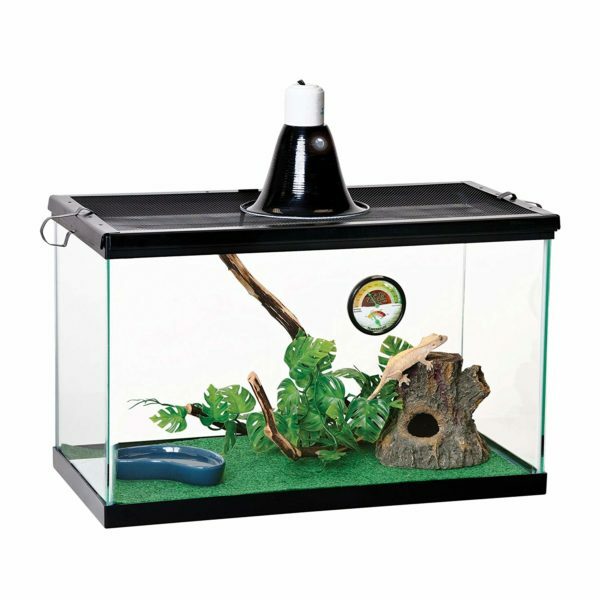 It comes as a complete 20 gallon turtle tank kit with easy setup features. The tank is also furnished with a full spectrum canopy and comes with a fit on filter with catridges that are easy to change. There is also a 15 watt fluorescent bulb that provides light which promotes plant growth, if any. The SeaClear Acrylic Aquarium Combo comes with a clear glass that can be viewed even from a distance and some pop up decorations that are quite entertaining. There is also 24 electrical light fixtures and reflector which makes it ideal for a 40 gallon turtle tank. 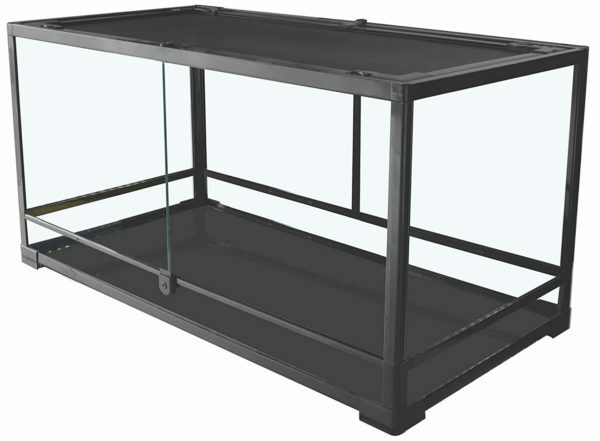 The Carolina Custom Cages are very easy to assemble, making them the best for first time hobbyists looking to setup a 40 gallon turtle tank. They also come in a variety of models including medium, tall, extra tall and extra tall large among others. Some features include a waterproofed base, hinged doors that easily slide to allow for ease when opening, a keylock security to keep the turtle inside safe and a tougher cardboard base. Turtle pier – It will need to crawl out of its water using a certain media. Filters – Are available in varieties. Choose a filter depending on the size of tank and number of turtles in the aquarium. For aesthetic lover, there are decorative filters to give the tank an attractive look. Cleaning kit – As messy as a turtle. Well, they can mess the tank a great deal. Cleaning regularly is not an option but a necessity. The cleaning kit comes in quite handy. Turtle Hideout – There are certain times when the turtle needs some loner moments. Create a turtle hideout so that the turtle does not miss out on this important ritual. Heat bulb – The water will be warmed to keep the right temperatures for the turtle. Heat bulbs are therefore a necessity if the pet is to stay healthy. Substrate – Turtles can disturb the substrate a great deal. However, there are custom designed artificial substrates that will stay put despite the turtle’s aggressive nature. Each tank size requires a different filter. The overall advice is usually to purchase a filter that will not require constant changing as the turtle grows. In fact, purchasing a big tank to avoid having to look for one every now and then as the turtle grows is cheap in the long run. Big aquariums are best with canister filters as they are able to handle large amounts of water at a go. Turtles being cold blooded animals should have their water temperatures just right to lead a long healthy life. Purchase a heater that will serve the tank effectively. Place it at the right place so that it is not interfered with. For aesthetic lovers, heaters with decorations can be very attractive. Decorations in an aquarium often give it a more exotic look and feel. A hobbyist can create the feel of a jungle by adding driftwood, waterfalls, floating plants, joggers and substrate into the tank. While doing these, take into consideration the type of turtle as some (soft-shelled turtle) are very soft bodied and may get injured in rough substrate. In their natural habitat, turtles bask in the sun to absorb vitamin D. Since the aquarium may not provide the same, the UV light is quite vital. Lack or insufficient vitamin D causes the turtle’s shell to be stunted. In fact, the turtle eventually stops to grow and may even die. The UV light is therefore essential and should be left on for between 10 and 12 hours each day. As earlier said, turtles are messy creatures. They interfere with literally everything within the tank including live plants, small rocks, plastic plants, plecostomus and even snails. That aside, they defecate quite frequently. Fix a suitable canister filter to help in the cleaning of water. Feed the turtle outside the tank to avoid leftovers that eventually dirty the aquarium. During cleaning of the tank, use methylene blue to scrub it. Bedatine should also do splendidly. After that, rinse the aquarium thoroughly. Do partial water changes at least once a week. The tank staying for long without a water change may increase the growth of gunk. There are additives that can be used to help clean the water. Read instructions carefully to use only the right amounts. Turtles are likely to chew most things put into the tank. Avoid placing cleaners like snails in there as this may be swallowed up even before it hits the bottom of the tank. Wash hands thoroughly after handling the turtle. They are known to harbor salmonella germs which may be harmful to human beings. Well, turtles are lovely, but need plenty of care. Ensure that the turtle aquarium remains clean for a healthy pet. There are many points that you should take note of if you are planning to get a turtle for a pet. Hopefully this guide is useful for you.